The morning started with the signing of a memorandum of understanding (MOU) between Governor Brown and the Chinese Minister of Commerce Gao Hucheng and government officials from Jiangsu, Inner Mongolia, Shanghai, Shandong, Guangdong and Chongqing. It was referenced by the Minister that the origins of this mission came from last year’s visit of the then- Vice President to Los Angeles to meet Governor Brown. Since then there has been an active working group of government officials from both China and California discussing key issues of importance. The Minister indicated that building new trade relations can be the cornerstone of a relationship — and that trade is not a zero-sum game, but a win for both sides. The Minister expressed that intellectual property protection was an issue for the Chinese government, just as export controls was an issue for the U.S. Governor Brown said this meeting is a solid move forward. He talked of the many changes in China since he last visited in 1986. The Governor explained the diversity in California and how the world is getting smaller. He said this meeting is the beginning that will lead to things which will impact the lives of millions of people. Many Chinese government officials were on hand, together with more than 150 Chinese business representatives, so there was ample opportunity for the California delegates to make new connections. This was a true indication of the interest among the Chinese to move forward with increased investment in California. Panels of both Chinese and California government officials went into further details about future cooperation. This was followed by a press conference with media from China and the U.S. The delegation then proceeded to a luncheon hosted by the American Chamber of Commerce in Beijing. The American Chamber of Commerce in the People’s Republic of China (AmCham China) is a non-profit organization that represents U.S. companies and individuals doing business in China. AmCham China’s membership comprises more than 3,500 individuals from more than 1,000 companies. It has more than 40 industry- and issue-specific forums and committees, offers unique services such as the Business Visa Program, holds a wide range of networking and informational events, and meets with U.S. and Chinese officials to discuss challenges and opportunities facing U.S. firms doing business in China. The chamber, in addition to its headquarters in Beijing, has chapters in Central China (Wuhan), Northeast China (Dalian), and Tianjin. Its mission is to help American companies succeed in China through advocacy, information, networking and business support services. Allan Zaremberg, President of the CalifornIa Chamber of Commerce, sat at the head table with the Governor and Christian Murck, President of AmCham Beijing. Murck was the former managing director of APCO in China. He has had a close working relationship with the CalChamber for many years now. Ten years ago, he attended the CalChamber International Breakfast and Board meeting and spoke on opportunities for California companies in China. The luncheon was hosted by HSBC, which opened a bank in 1865 in both Hong Kong and San Francisco. Governor Brown and Chris Davies, deputy CEO of HSBC China, discussed a wide range of subjects important to the U.S.-China relationship in an interview setting. In reference to the Governor’s 75th birthday on Sunday, the Governor explained how he had been the youngest U.S. Governor in the 20th century and the oldest U.S. Governor in the 21st century. In the evening, we departed for the U.S. Embassy in Beijing, built in 2008, for the California Investment Forum hosted by U.S. Ambassador Gary Locke. Ambassador Locke is the first Chinese American to serve as ambassador to China, as secretary of commerce and as Governor. He has had a good working relationship with the CalChamber. 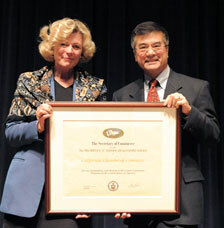 In 2009, Gary Locke presented the CalChamber with the President’s prestigious “Excellence for Export Service Award,” the nation’s highest award to honor U.S. exporters. He presented it during a ceremony at the National District Export Council Conference in Washington, D.C. The reception was attended by 300 Californian and Chinese business leaders and investors, organized by the U.S. Foreign Commercial Service, U.S. Ambassador Locke and the China Council for the Promotion of International Trade. Ambassador Locke made insightful remarks about the future of the growing relationship between China and California. He noted that California plays a key role in China’s trading relationship with the United States. Vice Minister of Commerce Wang Chao spoke about the importance of this relationship. 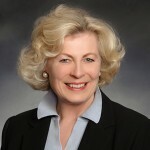 The Vice Minister visited California last July, when the California Chamber of Commerce hosted an International Luncheon Forum. Governor Brown followed by emphasizing that it is time to invest in California. There was then an announcement of a major Chinese investment in an area south of Jack London Square in Oakland, together with the announcement of a program to expand the number of California community college students to learn Mandarin Chinese and study in China. Following the reception, the delegation enjoyed dinner at the well-renowned Duck de Chine, which has been recognized as serving some of the city’s best roast duck.